July 14, 2010 - Bombardier Aerospace announced it has reached another significant Learjet 85 aircraft program milestone, having successfully built the first all-composite manufacturing validation unit (MVU) for the aircraft’s pressure fuselage section. The MVU was built in Montréal, where the Learjet 85 aircraft structural design team is located, using actual production tooling and with strong support from the program team based in Mexico. This unit will be used to validate the design concepts, manufacturing processes and quality as the program advances towards the beginning of production, scheduled for later this year. The 45,000 pounds (20,412 kg) of production tooling will soon be transferred to its permanent home, the new Learjet 85 aircraft facility in Querétaro, Mexico, where a second MVU will be built. Construction of the Learjet 85 aircraft manufacturing facility in Quéretaro is progressing to plan. The first tooling is scheduled for installation at the Quéretaro facility this month and the first production part will be built soon afterwards. 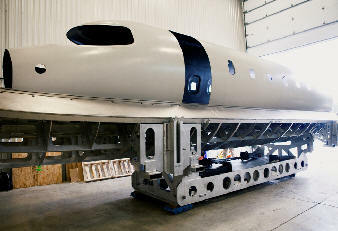 The Learjet 85 aircraft program is progressing full-speed ahead and the aircraft is on schedule for entry into service in 2013. Launched on October 30, 2007, the new Learjet 85 aircraft will be the first Bombardier Aerospace jet and first business jet designed for type certification under U.S. Federal Aviation Administration FAR Part 25 to use composite materials for all external primary structures. An extraordinary advancement in next-generation flight, the Learjet 85 aircraft’s all-composite* structure will allow Learjet aircraft designers to maximize cabin comfort while minimizing drag and improving performance. The Learjet 85 aircraft is set to deliver the extraordinary performance, superior technology and exceptional value Learjet aircraft owners expect. The jet is powered by two Pratt & Whitney Canada PW307B engines, each boasting 6,100 pounds of take-off thrust each at sea level 86°F (30°C) and low noise levels, while the advanced low NOx emission combuster offers reduced environmental impact. The Learjet 85 aircraft targets a high-speed cruise of Mach 0.82 and a transcontinental range of up to 3,000 nautical miles (5,556 km). The new Learjet 85 aircraft flight deck combines advanced technology with superior design elements for a cockpit environment unlike any other midsize jet. The latest in technological advancements and superior design aesthetics from Bombardier’s Global Vision flight deck are carried over to the Learjet 85 aircraft in order to create the ultimate Learjet aircraft flight control environment. The aircraft’s customized version Cabin Management System, developed by Lufthansa Technik, will feature a high-capacity Ethernet network with a digital amplifier to feed the high-fidelity speaker system and an interface to support the aircraft cabin environment including lighting and temperature control. The system’s open architecture also allows for easy integration of third-party equipment and new applications, such as High Definition features.